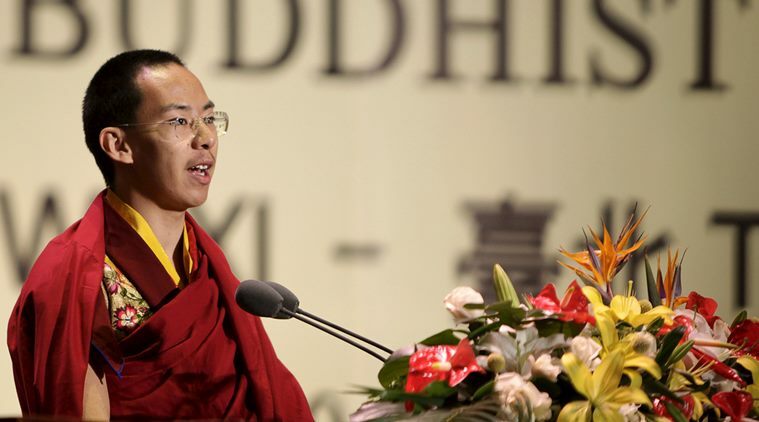 (TibetanReview.net, Dec18, 2015) – Gyaltsen Norbu, the Panchen Lama chosen by China to replace the one recognized by the Dalai Lama back in 1995, has returned to his home in Beijing on Dec 14 after a 14-day trip to Tibet, reported China’s online Tibet news service eng.tibet.cn Dec 16. The highlight of his visit was his participation in a ceremony on Dec 8 to mark the 20th anniversary of his enthronement by China. The Panchen Lama is Tibet’s second most prominent religious figure after Tibet’s currently exiled spiritual leader, the Dalai Lama. The Dalai Lama recognized six-year-old Gedhun Choekyi Nyima as the reincarnation of the late 10th Panchen Lama in 1995. But China took him and his family away, to be never seen again, and later appointed Gyaltsen Norbu in his place. The report said that during the enthronement ceremony, Gyaltsen Norbu had expressed heartfelt gratitude to the Party and the State Council (China’s cabinet) for their concern for him. He was cited as having described his grand enthronement ceremony on Dec 8, 1995 as an official passage by China of the Panchen’s lineage to him. He was cited as having described that as a reflection of “the full implementation of the Party’s policy of religious freedom, the Central Government’s historical authority toward reincarnation of Tibetan Buddhism; and the deep concern the CPC Central Committee and State Council has toward Tibetan Buddhism and the Tibetan people.” And he has vowed to live up to the expectations of the country and people. During his current tour of Tibet, Gyaltsen Norbu first visited the Jokhang Temple, where his Chinese government-supervised appointment was carried out on Nov 29, 1995. He later took a train ride from Lhasa to Shigatse where he was reported to have offered condolences and gifts to people affected by the Apr 25 earthquake earlier this year. During the current visit, he was also “elected” the Chairman of the Tibet Development Foundation, during which he vowed to be patriotic and ready to meet the need of masses in their religious beliefs while making his own contribution to Tibet’s poverty reduction.